Pandosia, created by the four goddesses, has seen its fair share of war and peace. Now is not a time for peace. A war has begun between the neighboring countries of Aksum and Sybaris. Sybaris has ambushed Aksum's close ally, the small country of Mora, without warning, massacring many. This is a complete mod. The final chapter is chapter 20. Including the prologue and two "gaidens" that gives you 23 chapters of content. Story spoiler characters are in here. You have been warned. NOTE: Ava's growths only increase if you're on patch v3.0.3 or higher! Please note that, in order to keep myself from burning out, every character has 1 support partner. This may change in the future. If it does, it'll be the far future most likely. 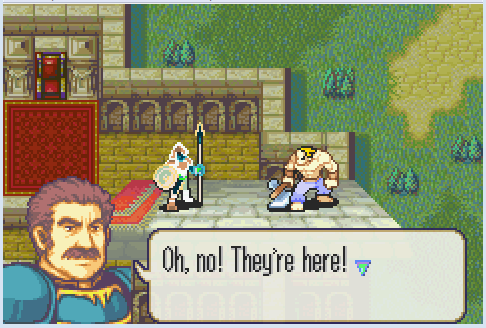 Nice screens, the hack looks really good but the only thing that is bothering me is that you reuse some characters, but it's your hack. Did you really already made 9 chapters? Nice screens, the hack looks really good the only thing that I don't like is that you are reusing some characters, but it's your hack. The character thing I've gotten a lot and some characters may get changed to OC's in the future. And yes, there are 10 chapters actually counting the Prologue. I've been working on this for quite some time. How many chapters you have planned? Hmm, let's see *Counts with his fingers* 4 more I believe though another might get slipped in. Basically, I'm gunning for the hack to end at chapter 13 or 14. I just has one thing to note, your screenies are all reduced in size, might want to fix that. Beats me, why that is. But they aren't reduced too much so I'm not that miffed. The hack is full custome, only the characters are old. The prologue was a way to easy Vex could defeat all enemies by himself. However, with that said I'll look into upping the difficulty a little for the prologue. I ain't even mad, bro. Dude, it's vanilla...Did you even read the post? A hack that does not change event or map data. 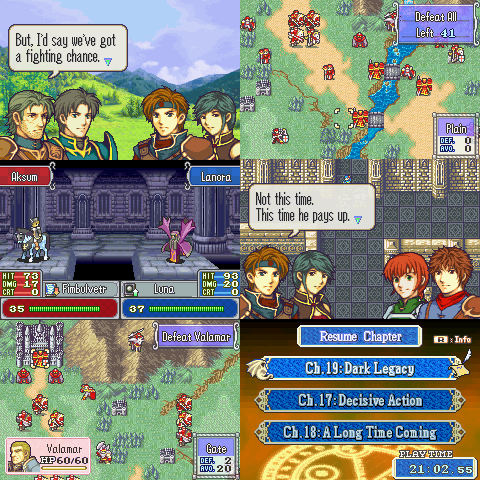 Most Reskins typically make graphical, stat, class and text changes with a cross over type story where the Fire Emblem cast meets characters from other Fire Emblem games or different franchises entirely. A Reskin hack that, although for the most part is a reskin, does change a few maps and event data here and there, but not enough to make the experience so different from a reskin. The opposite of a reskin hack. A vanilla hack makes little, if any changes to graphics, but the maps and event data are all entirely new. May also include text, class and character stat changes. Every chapter has custom events and maps. None are reused. Yay, a vanilla hack! With good progress! I will download and enjoy this I am SURE, it looks great. < And that will happen in 2 weeks. If there are any major bugs, glitches, gameplay imbalances, etc., should we notify you? Just report them here. I already have my own to do list so I'll add them to it. Also, if you read the Release Info.txt, I want to know if the Canto/wrong music bug was fixed. I didn't test it, just added some event commands I thought should work. Though I'm thinking it's the former since the sum of his growth rates is the same as almost everyone else. Might be his starting stats though. great, Vanilla was my next guess :D, and Dr.Sholes, nope, I didn't read it. Oh ho I see you've been quite busy eh Prime? Looks like something for me to try out here soon enough. As in another 15 minutes from now. Anyways....me likey, me play in 2 minutes, me think good. Man some people just don't get stuff. Well I'm on Chapter 5 and the only thing I noticed to report has already been stated. It's pretty good (I've only played the prologue though) Vex's palette is weird, the 2nd color is gray and the 1st is purple.